Proven to withstand some of the harshest weather on earth, resilient construction technology is now available to builders in hazard-prone coastal areas and "tornado alley" in the US. For over 13 years, Philippines homes built with patented building technology have endured multiple annual storms and typhoons like the recent Typhoon Haiyan. In the US, over the last 30 years, natural disasters average almost $20 billion in damages annually. 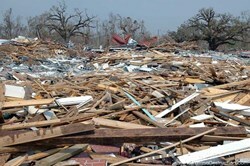 Too bad the school in Moore, Oklahoma was not built with our technology, had it been, those kids would still be alive. Riji Dixon, CEO of newly formed Defender Homes, Inc., recently acquired the exclusive US rights to patented and affordable construction technology developed in the Philippines to build homes which withstand hurricane and tornado winds up to 200 mph. The company is completing its first Showcase home in Gulf Shores, an area which has been hit several times by hurricanes. The technology was invented by an engineer in the Philippines about 13 years ago, and has gained significant acceptance with over 30,000 of these homes built there, and almost 60,000 worldwide in 15 countries. In addition to their superior high wind resistance, these structures are built to withstand the most common threats of mold, fire, and termites. Due to their unique construction, the homes also resist water incursion, small arms ballistics, sinkholes and earthquakes up to 7.0 on the Richter scale. “In addition to homes, this process is perfect for the military and schools,” Dixon said. Engineers from across the nation have visited the Showcase home in Gulf Shores and are extremely impressed with the quality and safety provided by the structure. Dixon is a builder on the Gulf Coast, and saw firsthand the devastation high winds bring when his home and neighborhood was destroyed a few years ago by tornadoes in Arkansas. “Too bad the school in Moore, Oklahoma was not built with our technology, had it been, those kids would still be alive,” Dixon added. The Defender building process is “green”-- using up to 75% fewer trees and is energy efficient. Compared to traditional wood frame homes, Defender structures can anticipate a 40% reduction in heating & cooling costs and insurance reductions of 50%. Defender empowers builders and developers to deploy its resilient building technology in their communities by providing the patented materials and training. Interested parties should visit Defender websites for more information and arrange a tour of the Showcase home in Gulf Shores, AL. FORWARD LOOKING STATEMENTS: This document may contain forward looking statements protected by the Private Securities Litigation Reform Act of 1995, as amended. Such statements include words like “anticipate,” “hope,” “assume,” “expect,” “project,” “should,” “may,” “forecast,” “believes,” or variants thereof or similar words. Actual results may differ from those results indicated by forward looking statements. Investors and other readers of this document should not rely on forward looking statements in making investment decisions or assume results will be as indicated by forward looking statements. There are a number of factors, many beyond the control of or beyond the ability to foresee of the above company, that determine actual results. Neither this document nor any of its contents are an offer to sell any securities, investment or tax advice, legal advice, or a solicitation of any offer to purchase or sell securities. Any offer of securities will only be made by separate written documents that are lawful in the jurisdiction in question and issued only to qualified investors. URL’s referenced above do not incorporate any content into this document. This document speaks only as of the date first written above. Business and financial results of the above company are subject to a number of risk factors, including general economic conditions, responses of competitors, changes in consumers’ or end users’ demand or tastes, regulatory environment, litigation, labor or material shortages, changes in technology and Acts of God.